This centre is located in Gallows Corner on the outskirts of Romford, near to several bus stops, shops and amenities. Tenants can access the property 24-hours a day and take advantage of the fantastic on-site facilities. These include mail handling, kitchen and ample car parking. It is important to note that unfortunately this office does not benefit from any natural lighting. At just £300 per month for the 180 square foot space, this is great value. Recently refurbished to a high standard, this landmark building will soon be opening to offer modern offices decorated with great attention to details. 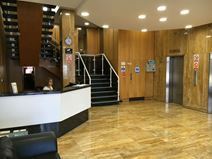 Centrally located in Romford and close to the railway station, this building enjoys excellent transport connections. Situated in Romford's office quarter, this 4th floor space is large enough to fit up to 100 workstations with meeting room access available. The space is currently a blank canvas ready for a company to put their own stamp on it. Romford has various amenities including places to eat and drink, as well as hotels too suit different needs and requirements. There is a direct rail link to London Liverpool Street. 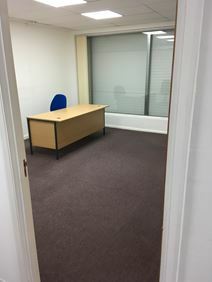 Just 5 minutes walk from Romford railway station, and 10 minutes from various motorways, this secure building offers a range of office suites in a pleasant working environment. Available now on all-inclusive flexible terms. Adjoining the Liberty Shopping Centre this eight-storey office building benefits from a prominent location on the Western Road, close to Romford Railway Station. The centre has 10 newly refurbished self-contained serviced offices available suitable from one to eight people.